Tuesday 2nd May 2017 was a special day for the Armadale Meditation Group. We celebrated 30 years of meditation and guidance by the monks of Bodhinyana Monastery in Serpentine. For this special occasion Ajahn Brahm and Venerable Akaliko graced us with their presence. Ajahn Brahm likes to refer to the group as Club Med. Being typically Aussie, we like that. 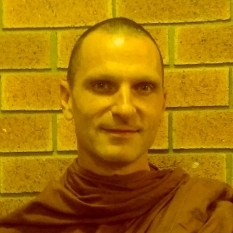 Venerable Akaliko once remarked that on his way to Club Med one evening [his first teaching at Armadale], he was considering a topic for his Dharma talk when he realised that there is "no fail in Armadale". The group has adopted these slogans and now we have T-shirts that clearly state who we are and how we feel about meditation. 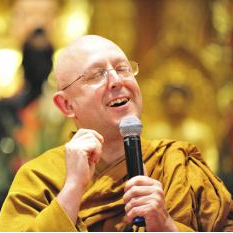 For the benefit of the five new people who joined us for our celebrations, Ajahn gave us a guided beginners meditation. Ajahn used his wit, humour, common sense and stories to describe the purpose of meditation and why worrying about the future or reliving the past, is pointless. We can't change the past and we can't control the future, so why do we worry so. Give it a miss and meditate instead. After meditation Ajahn gave a Dharma talk and joined us for our 30th Year celebrations.